I am finally back in the DIY groove. I have spent the past few weeks doing tons of dollar bin crafts with the kids I nanny- hence the lack of posting- and have finally completed something for myself! Remember the wreath that I was trying to make with paper rosebuds? Well it was taking entirely too much time and energy for my liking, so I decided to adjust my plan. I searched Pinterest for some ideas, and I found the right one. 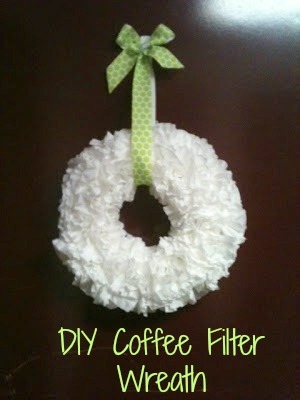 So I began by taking medium coffee filters and by brand new glue gun, and just gluing them in bunches to a wreath form. I glued the filters very close together, sometimes overlapping. This gave me the effect that I was looking for of sort of imitating the shape of carnations. I didn't think attaching a hook to the back of a foam wreath form would work in this case, so I went to Hobby Lobby and picked out some nice multi-seasonal ribbon. The lime green polka dots look really nice against the burgundy door, and I love the little bow at the top. So cute for an end of summer wreath! I am SO glad I (sort of) stayed with my wreath project. And now that I have this one, I am much more motivated to make one for fall. And I am thinking that for winter, I will simply change the ribbon on this white one!